Malta is expected to be spruced up as 60 clean-ups are planned across the island on Saturday. Around 1,800 volunteers are expected to take part in the clean-ups, in conjunction with World Clean-Up Day. The events are being supported by the Cleansing Department, Ambjent Malta and Wasteserv - who will be providing refuse trucks, bags, and other essentials. Conrad Borg Manché, who heads Ambjent Malta, said the organisers hoped this year’s nationwide clean up would be even bigger than last year’s. Last year more than 2,000 bags of rubbish were filled across the island. A quarter of the clean-up material were plastic bottles, and nearly half of all the bags were sent to the landfill. 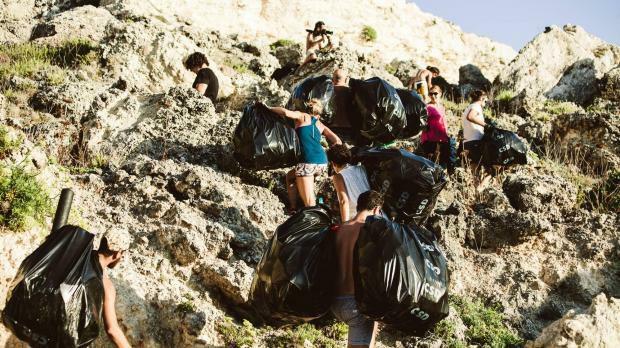 A whopping 10.7 tons of waste were cleared from L-Aħrax tal-Mellieħa - a Natura 200 site - during a similar clean-up last year. That's not all.Volunteers who answered the Żibel group’s call had last year picked up 2.6 tonnes of general waste, 4.6 tonnes of rusted metal and broken glass, over 300kg of recyclable waste and 2.8 tonnes of rubbish from the sea. Cami Appelgren from Let’s Do It Malta said most of the clean-ups for this year's event would be held between 8am and 12pm. Malta Clean Up, Get Trashed Malta, and the Maya Foundation are also involved in putting the event together. More information on the location of the clean ups and how to get involved are available on the Let’s Do It Malta Facebook page.